I have to be honest, I'm loving these made up days celebrating specific foods. 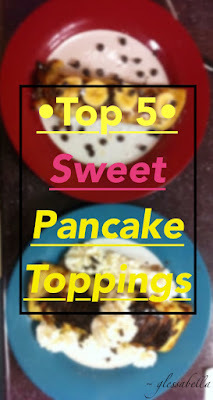 Pancake Day has got to be one of the most celebrated food appreciation days out there! Pancake Day is actually originally called Shrove Tuesday, the day before the start of the 40 days of Lent. Lots of people tend to feast on pancakes on this day, hence why it is now dedicated to pancake gluttony! There are so many different types of pancakes to make on a glorious day such as this one: American buttermilk pancakes, crêpes, vegan oat pancakes... the pancake has evolved to such delicious dimensions and it will only ever continue. But the best thing about pancakes is that there are so many choices for toppings! I'll admit, I love me a good savoury pancake, but come on... the real deal is on the sweeter side. I mean, hello? Sweet pancakes are an excuse to have dessert for breakfast! I was never really sure why the apple and cinnamon combination was associated with Christmas because it's great all year round, especially on Pancake Day! You've got the natural sweetness of the cooked apples, the zing of the cinnamon, and maybe even the hint of sourness from a drop of lemon juice... deeeeelish! Fruit on pancakes can never go wrong. Some fresh juicy berries (including strawberries, though they're technically not berries) harmlessly mask out all the calories in the pancakes and allows you to convince yourself that you're actually being healthy - which isn't all false, but isn't all true either! Sweet berries with the sour juices of kiwi make for a delightful, light pancake meal... and why not dollop some chocolate sauce on there? Don't wanna risk being too healthy on an approved gluttonous day now, would we? Just think of the combination between the naturally savoury nuts with the sweet honey coating... Yum. This topping is an opportunity to have a satisfying crunch against the soft fluffiness of the pancakes. For me, some avocado adds dimension to the dish, plus you can put avocado on anything these days, but you can add anything you want! I recommend spreading some butter and drizzling some golden syrup too if the plate isn't sweet enough just yet. Similarly to the nuts, the pretzels also present the crunch factor. It seems to be a trend lately to have salted caramel and it's obvious why - it's genius! Salt really stimulates our tastebuds when added with something sweet, and what better than to have salted caramel trickling down from the bites of golden pancake on your fork just before you indulge in its tantalising sensation? Agh... yes... too good, too good. A classic: the simple topping that is smooth melting butter and a good glob of sticky, glossy maple syrup. That is all. There are soooo many toppings that tickle my fancy, an endless list of both sweet AND savoury toppings! AHH! TOO MANY! Go wild today! Be creative with your toppings and don't be afraid to try out some new combinations. You might just set the newest food trend. So Happy Pancake Day, everyone! Enjoy those pans filled with cake goodness. You shall hear from me again soon... if I haven't fallen into a food coma before then.